Natto is a traditional Japanese dish made from soybeans fermented with Bacillus subtilis. Keep in mind that we do not recommend eating soybeans unless they are fermented. The key element in natto is the fermentation of the soybeans, which make them easier to digest while increasing your body’s ability to absorb nutrients. Fermented foods and drinks, such as natto, are the cornerstone of the Body Ecology Diet because they are a great source of probiotics. Natto has a long history as a super food. It has a stringy consistency, strong smell and an acquired taste. Primarily eaten as a breakfast staple in Japan for over 1,000 years, natto is a great source of protein and is low in calories. But it goes even further to balance your inner and outer health. Unlike many foods that are only rich in Vitamin K1, natto is rich in both types of Vitamin K. Natto increases the health and strength of your skin, heart and bones. •	Natto is rich in vitamin K2, which could reduce bone loss in post-menopausal women by as much as 80 percent. 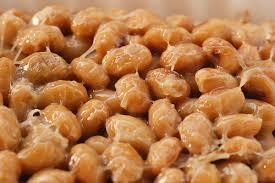 •	Fermented soybeans such as natto contain Vitamin PQQ, which is very important for the skin. •	Vitamin K is repeatedly shown to reduce blood clots by slowing arterial calcification, enhance liver function and encourage the flow of urine. •	Vitamin K2 has a better bioavailability that K1. Studies show that this molecule remains in the body for a longer period and is more effective at lower doses, hence is much more bio-effective. •	Additionally, natto suppresses immune reactions. Natto is occasionally used in other foods, such as natto sushi, natto toast, in Miso Soup, tamagoyaki, salad, as an ingredient in okonomiyaki, or even with spaghetti. Even if you’ve experienced soy allergies, natto may not bother you. The fermentation process breaks down the difficult-to-digest proteins that many are sensitive to, rendering them unrecognizable as a problem food to your immune system! Now that you know the vitality secret the Japanese have know for a thousand years, make fermented foods and drinks, like natto, part of YOUR diet today. Sometimes soybeans are crushed and fermented. This is called 'hikiwari natto'. Natto in Japan is relished as a delicacy. Natto is made from soybeans, smaller beans are preferred, and as the fermentation process will be able to reach the center of the bean more easily. The beans are washed and soaked in water for 12 to 20 hours to increase their size. Next, the soybeans are steamed for 6 hours, although a Pressure cooker may be used to reduce the time. 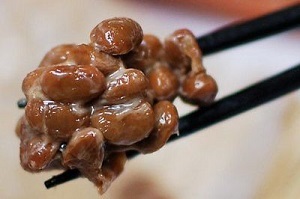 The beans are mixed with the bacterium Bacillus subtilis, known as Natto Kin in Japanese. From this point on, care must to be taken to keep the ingredients away from impurities and other bacteria. The mixture is fermented at 40 °C (104 °F) for up to 24 hours. Afterward the natto is cooled, then aged in a refrigerator for up to one week to allow the development of stringiness. 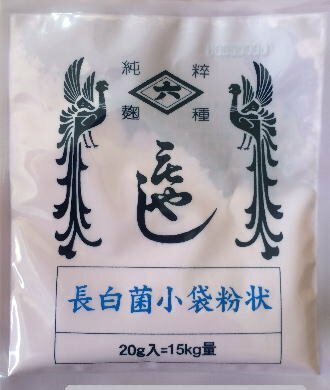 Most of the times the Natto starters are available only in big batches, to make 50 kg and up, we are selling the original Natto Kin spores from Japan in smaller batches. We offer 1 batch, which contains 2 starter sachets, to the Natto Home Maker, or for customers who want to tryout a batch first, and do not want to buy in large quantities. Our Natto Starter (Bacillus subtilis ) spores, original from Japan from the NattoMoto factory will create a delicious 5 Lbs total batch for the Natto Home maker. Our simple instructions included will make you easy Natto in no time, never visit the expensive special supermarkets anymore to buy Natto Kin, make it your own home. Our Original Japanese Natto Starter will producing delicious Natto. We provide you with detailed instructions how to make this delicious Natto in order to enjoy dishes of this fine product. 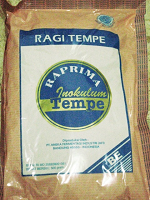 Tempeh Starter Raprima. (Rhizopus Oligosporus ) 9 bags 4.5 Kg. Tempeh Starter Raprima. (Rhizopus Oligosporus ) 3 bags 1.5 Kg.